I was born on August 15, 1967 in a poor handloom family located at Srikalahasti town. Since my childhood, I have been fascinated with line drawings on the slate and making clay toys. Understanding my interest in the art, my father enrolled me in Kalamkari art classes in my 12th year under Late Sri S. Rambhoji Naik, (National Awardee) who was also working as a technical assistant in Government Kalamkari training centre, Srikalahasti. I learnt the art alongside continuing my school education. 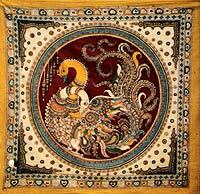 I trained for nearly 10 years from my kalamkari teacher besides my higher education. During the period of training I got lot of exposure in making different shades of natural colours using plants, leaves and flowers. I work mainly with natural dyes on cotton cloth. Although Kalamkari art is an ancient Indian traditional painting, particularly related to the Hindu mythology, I have also made number of paintings on the other themes such as Buddha, Jesus Christ and everday life in our village. For the first time, in the Kalamkari art field, I have drawn very small size figures (5 cms in height) with a bamboo stick pen (Kalam). For this type of miniature painting (Sampoorna Ramayan), I was awarded the prestigious ‘National Award’ for the year 1992 from the Honorable President of India. I got special notice for my paintings ‘Weaving woman’ and ‘Farmer in the field’ which highlighted the plight of poor handloom and farmer families. I have illustrated “Mangoes and Bananas” by Nathan kumar Scott, Tara publishers, Chennai and “How to learn Kalamkari” (awaiting publication). I have also had special exposure on temple architecture. I have visited important ancient temples likeTanjore, Madurai, Kanchi, Trichy, etc. which are famous for sculptures of Hindu mythology, to study and understand the different styles of idols. In addition to kalamkari, I have made many cement sculptures for temple decoration. After the death of my art teacher in 1989, I have been continuing this art by giving free training to a large number of students at Srikalahasti town, Chittoor district. So far I have trained eight students. Kalamkari hastha kala kendram (Before registration it was Sri Rambhoji Naik kalamkari Kala Kendram) was started in 1989 in memory of late Shri Rambhoji Naik, National Awardee in Kalamkari and also my kalamkari art teacher. This is one of the small organizations promoting and identifying traditional arts and artisans for their improvement. Since 1989, every year on August 31st we celebrate its Anniversary. As a part of this annual ceremony, we conduct drawing competition to students (From LKG to Bachelor degree students) and also felicitate the traditional artisans who have not gained much recognition. Since beginning I have been serving as a General Secretary for this organization. Madras Craft Museum(Craft Foundation): Sampoorna Ramayanam miniature painting (2.00X1.30 Meter), which was selected for National Award in 1992. 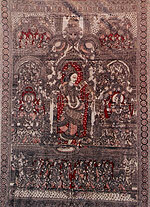 The Ashmolean Museum, Oxford, UK: One large kalamkari painting (5.00 x 2.60 Meters) namely “Sampoorna Ramayanam” (which was selected for ‘Mahatma Gandhi Birth Centenary Memorial award’ in 1993, from Victoria Technical Institute, Chennai) was purchased by the Ashmolean Museum (Eastern Arts section). Shilpa kala vedika, Shilparamam, Hyderabad: For the first time, in the kalamkari art field, a major kalamkari panel work around 150 running meters prepared. The painting was made on silk cloth using natural dyes and all the figures related to rural and traditional musicians (not mythological pictures). Handicraft emporiumssuch as Victoria Technical Institute, Chennai, Andhra Pradesh Handicrafts Development Corporation, Kalanjali, Contemporary Arts & Crafts, Hyderabd; Kaveri, Dastkar, Craft Council of India, Craft council of Andhrapradesh, etc. have collected my work. Mahatma Gandhi Birth Centenary Memorial Awardsecond time in 1990 from Victoria Technical Institute (VTI), Madras for Sri Sita Rama Charitra Painting. Mahatma Gandhi Birth Centenary Memorial Awardthird time in 1993 from Victoria Technical Institute (VTI), Madras for Sampoorna Ramayanam Painting. National Award(Govt. of India) in 1994 from Honourable President of India at New Delhi for Sampoorna Ramayan Painting. Outstanding Young Person Awardin 1994 from the Junior Chamber, Tirupati, India. 1993, Agra conducted by the Ministry of Textiles, Govt.of India. Kalamkari art demonstration at Surajkund Mela – 95, New Delhi conducted by Govt.of India. Scientist, Centre for Materials for Electronics Technology (C-MET), Govt. of India, Cherlapally, Hyderabad-51.